Know this: Japan loves mayonnaise. In Japan, it’s slathered all sorts of eats, especially soul food like takoyaki and okonomiyaki. But the country’s love affair with mayo didn’t begin until the 20th century after the first domestic maker Kewpie launched its maiden made-in-Japan mayonnaise in 1925. Kewpie was founded by Toichiro Nakashima, who had gone abroad to study food production. While in the United States, Nakashima discovered mayo, and borrowing an iconic bit of Americana, the Kewpie characters conceived by the American cartoonist Rose O’Neill, he set up his own food company when he returned home. The rest, as they say, is Japanese mayonnaise history. 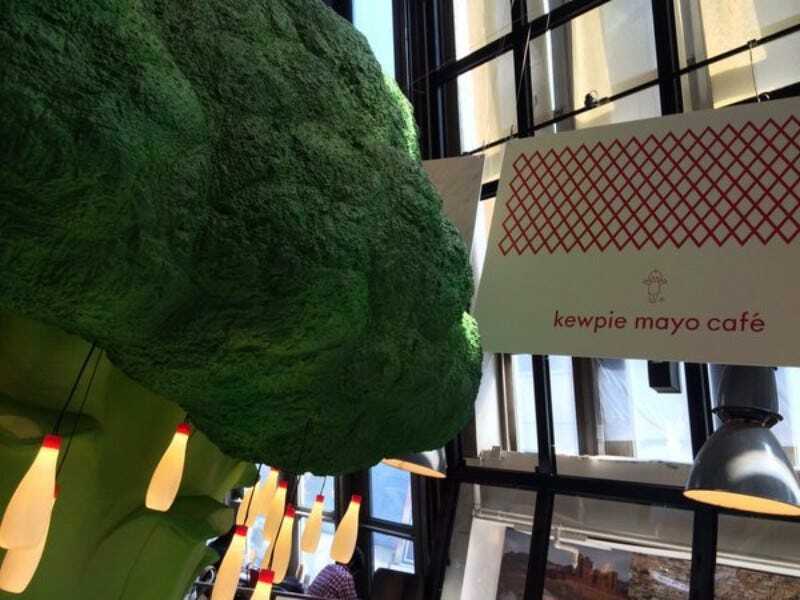 Kewpie Mayonnaise is, once again, rolling out limited-edition mayonnaise cafes in Nagoya and Tokyo as it did last year. Check out photos from the previous mayo cafe. Look how Kewpie’s iconic squeezable bottles dangle from giant broccoli! Nakashima had hoped that mayonnaise would help Japanese people eat more vegetables, which is why healthy food is served up at mayonnaise cafes. There are different kinds of mayo on hand, including olive, basil and tomato mayo. Here is a sneak peak at this year’s mayo cafes. The mayonnaise cafes will only be open from March 1 to March 31 in Tokyo and from April 3 to April 30 in Nagoya. But if you miss them, fret not because Japan also has a mayonnaise museum.